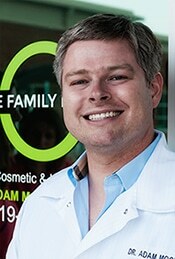 Dr. Moore grew up in the Knightdale area and attended UNC-Chapel Hill, where he received his BS in biochemistry. After several internships and shadowing numerous health care professionals in college, Dr. Moore decided to pursue a career in dentistry at the UNC School of Dentistry. To provide the best possible care to his future patients, Dr. Moore completed a general dentistry residency at the University of New Mexico Hospital. This residency involved more than 800 hours of training with some of the top general dentists and dental specialists in the Southwest. In addition to this residency, Dr. Moore completes over 100 hours of continuing education training every year. Because of his extensive training and dedication to continuing education, Dr. Moore is not only knowledgeable of the latest techniques and best practices, but he is also is apart of the elite Fellowship of General Dentistry. Only 6% of general dentist in the U.S. and Canada are Academy of General Dentistry Fellows and have achieved such an honor. Because of his achievements and accolades, Dr. Moore has been asked by Dental Adviser™ to evaluate new technologies and products. This extensive training allows Dr. Moore to provide a wide range of dental services. Moore Family Dentistry the skills and background to address just about any dental issue you may need assistance with. When Dr. Moore is not taking additional continuing education courses, he enjoys spending quality time with his family and friends, volunteering at Wake Smiles Dental Clinic, and watching the Tarheels. Dr. Moore wants everybody to know that he cheers for N.C. State as long as they are not playing Carolina! 2019 All Rights Reserved | Website by DDSRank. Disclaimer: Garner, NC dentist, Dr. Adam Moore, provides cosmetic, family, and general dentistry information on his website, which is not intended to be medical advice. If you are interested in more information about cosmetic procedures, restorative dentistry, TMJ treatment, or sedation options, please contact Moore Smiles for a personal consultation. Our dental office in Garner, NC proudly serves patients from Garner, Raleigh, Clayton, Fuquay Varina, Holly Springs, Cary, Apex, Knightdale, and surrounding NC communities. *Financing only available to residents in the state of North Carolina.